As one of only 2 Antaneea teachers in the UK, I run small personally guided workshops once or twice a year only. This is a 4-day workshop that guides you through the process of anchoring the healing eenrgy of colour into the body through gentle and loving body work, and assists in releasing emotionally 'frozen' trauma from the tissues. You will both give and receive 3 treatments over the 4 days, as you enrich your own healing potential through the combination of gentle massage, coloured oils, sound tools, visualisation, geometry and fragrance. This is a multi sensory experience as a tapestry of colour and energy is lovingly woven around the body. The body absorbs the healing energy of colour as it is anointed 3 times with the divine ‘Oils of Transformation™.’ Each layer has its own sequence of colours, the first supports your physical body. The second brings emotional stability; and the final layer aligns you with your potential. Once this doorway has been opened it is important to lock in the new vibration. This is done through the use of sound and geometry. The combination of colour and sound assists you in remembering your true purpose in life, and is both deeply supportive and transformational. This workshop offers you a safe space to go through your own healing process, while giving you the skills to become an Antaneea therapist if you choose that path. You will receive a comprehensive workbook, charts and the oils needed during the workshop will be provided. Oils/Sprays for further personal use and case studies can be purchased at the workshop. 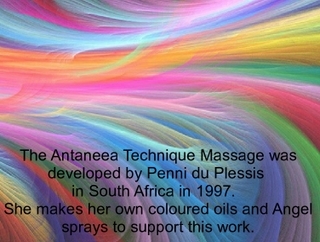 Watch Penni's introduction to the Antaneea Technique in the short video below! "I absolutely loved every minute of this workshop and released things I never imagined I was still holding on to. Thankyou for an incredible experience"